Life is full of unexpected happenings that can leave behind disasters. When Mother Nature turns cruel, for instance, business facilities and other commercial properties often bear the brunt, and business owners can be left scrambling to repair damaged property and recover from the catastrophe. When disaster strikes your building and you find yourself in need of emergency commercial roof repair, do you know where to turn? When emergencies arise, building owners can feel harried and hurried to find someone to repair their roof damage as quickly as possible. This state of stress and urgency can make them vulnerable to the ploys of roof scammers. 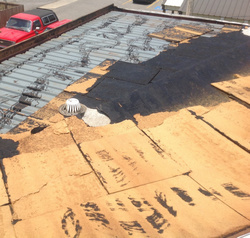 An unfortunate ongoing trend in the roofing industry has caused no end of trouble for innocent business owners. It’s a scam associated with “storm chasing,” and it involves con artists who prey on the victims of natural disasters. “Storm chasers” travel to an area that has been hit hard by a large storm or other catastrophic event resulting in more roof damage calls than the local roofing companies can handle. The storm chasers post help wanted ads promising applicants a six-figure income in a short time period. From responses to the ad, a “storm chaser” crew is formed. The head storm chasers get in touch with a legitimate local roofing company, offering extra workers to help with the overabundance of storm damage repair work. In exchange, the storm chasers are authorized to use the local company’s name and warranty, and the local company gets a big payout from profit sharing. The storm chasers saturate the area, taking on hundreds of roofing jobs using the local company’s name. Clients are quick to hire them, as they recognize the name of the “local” business. Big insurance payouts are collected for the storm damage roof repairs and replacements performed, and the storm chasers and their host company pocket a tidy sum. The storm chasers leave the area (money in hand). Eventually, the shoddy roofing work they’ve performed begins to fail—but, by that time, they are long gone. 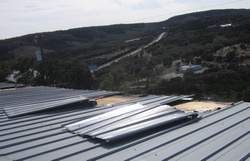 Typically, the local host company can’t honor all of the warrantee claims that begin flooding in for the improperly performed roofing work; the company either goes out of business or continues operating but with an irreparably damaged reputation. Whether you fall victim to a scam like this or find yourself on the losing end of a bad roofing job in some other way, the stress, costs and damage to your building can become insurmountable after an irresponsible or inexperienced roofer has crossed your path. There is good news for commercial building owners, however, and it comes in the form of the Choice Roof Contractor Group. When your building is damaged by a storm or other event and you need emergency services, this elite association of roofing professionals work together to provide the skilled labor needed while keeping each other accountable. To become an endorsed member, a roofing professional must first be sponsored by an existing group member and then must meet strict criteria, including possessing full licensure & insurance, verified track record via reference checking, and more. Group membership carries many benefits for that trickle down to enhance the service customers receive, such as group-wide accountability, shared expertise and the ability to offer a “Lifetime Service Guarantee” for work performed. From insurance claims help to top-notch roof repairs and replacement, the members of the Choice Roof Contractor Group are here to help you in the aftermath of a storm. To find a member in your area, simply call us at (800) 670-5583 or visit the contact page of our website. Cami is one of the main writers at Choice Roof Contractor Group. Leveraging her unique background in the space and more than a decade of professional writing experience, she has written countless articles on the various aspects of commercial roofs and has gained the respect of building owners and contractors across the country. This entry was posted on Sunday, July 22nd, 2018 at 1:49 pm and is filed under Building Owners, Commercial Roofing, Insurance Claims. You can follow any responses to this entry through the Comments Feed feed. You can skip to the end and leave a response. Pinging is currently not allowed.